When it comes to homemade ice cream, I’ve found the magic formula. The perfect combination of ingredients which results in a rich, smooth and creamy texture with just enough sweetness for you to be able to trash it up with drop-dead-gorgeous toppings (like strawberry cheesecake) without going OTT. To put it into other, less dramatic words: I’ve found a great ice cream base. This is the basic ice cream base I’ve been using for a while now and it really is the best one I’ve ever used. You just can’t beat the texture. I tried increasing the quantity of milk and cream whilst keeping the egg yolks the same and discovered that it’s the egg yolks that really make this recipe. As icky as it might sound, eggs yolks are where it’s at when it comes to homemade ice cream. Before I got my hands on the best ice cream maker in the world ever ever ever, I always used to churn my ice cream by hand, returning to the fridge every couple of hours to give it another stir. If that’s the way you ice cream, I seriously suggest you either go out and buy yourself an ice cream machine or add it onto your Christmas/birthday/anniversary/please-buy-me-one-of-these list. Not only does having an ice cream machine take most of the time and effort out of making ice cream, but the texture is simply incomparable. That’s all I’m going to say. Hand-churned ice cream will never be as good as machine-churned ice cream unless you sit in a walk-in freeze (oxymoron?) and stir, stir, stir your ice cream until it freezes. Fancy doing that? Didn’t think so. How do you feel about white chocolate in your cheesecake? For years, I was A-okay with regular cheesecake or even strawberry cheesecake without trashing it up with white chocolate, but now, I can’t resist. Every single cheesecake I make has to have melted white chocolate swirled in. I think it has something to do with how awesome this Creamy Lemon Layer Pie is. Three months later and it’s still my favourite pie. That’s saying something! And I think I got the idea for throwing white chocolate chips into the cheesecake topping from my local frozen yoghurt shop. They’ve completely given up on the whole ‘frozen yoghurt really is good for you!’ saga and have decided to start throwing white, dark and milk chocolate chips into their muesli topping, because why not? In a medium to large bowl, beat the cream cheese, egg yolks and sugar together until well combined. In a medium to large saucepan over a medium-high heat, bring the milk and cream to the boil. When boiling, immediately remove from the heat and pour over the cream cheese, egg yolk and sugar mixture, stirring all the while so you don't end up with weird scrambled eggs. When both sets of ingredients are well combined, pour everything back into the saucepan and cook over a medium heat for around 20 minutes - stirring regularly - until the ice cream base is thick enough to coat the back of a spoon. Remove the ice cream base from the heat and leave to cool to room temperature. 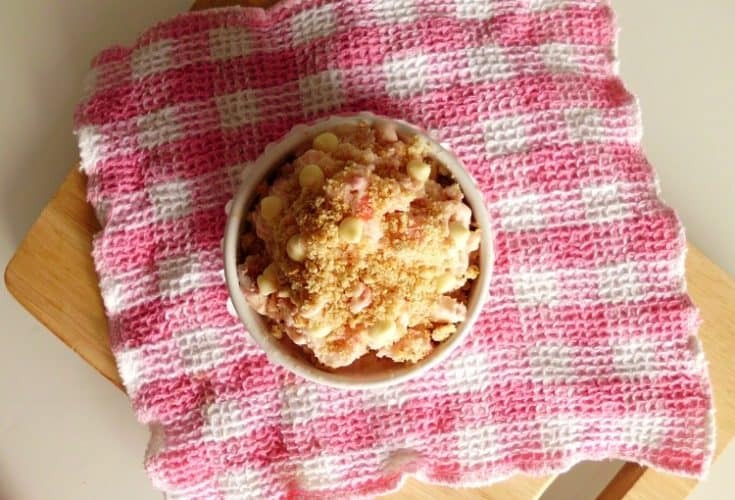 When cool, stir in the vanilla extract, chopped strawberries and Graham Cracker or Digestive crumbs. Place in the fridge overnight to fully cool, then churn in your ice cream machine according to the machine's instructions. When you're ready to serve, place a large scoop of ice cream into a bowl and top with extra Graham Cracker or Digestive crumbs and white chocolate chips. Here are the link parties I link up to. Come and party with me! Yum!! I love homemade ice cream. this looks delish!! I love ice cream! This looks amazing. Yep, I need to put a maker on my “gotta have it” list. 🙂 Thanks for sharing. Oh this ice-cream sounds heavenly!!! Fabulous! I will have to try this…thanks for sharing on the Thursday Blog Hop! !